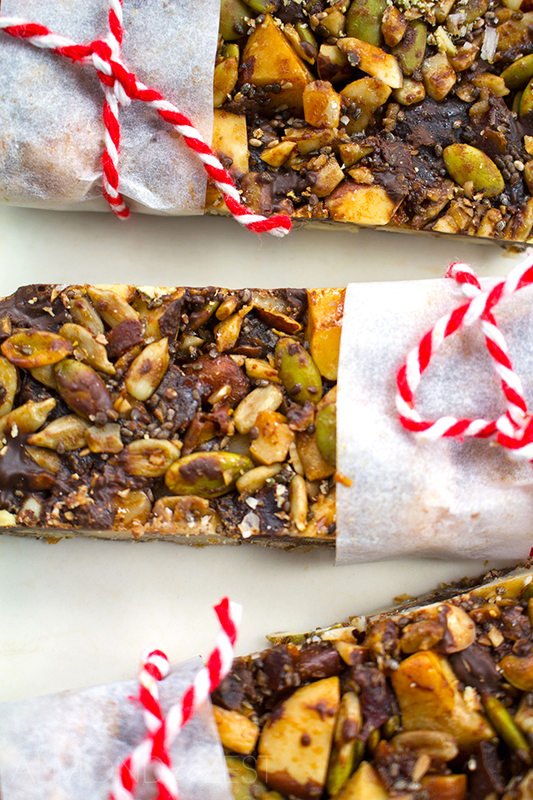 Great for a snack or an on the run breakfast fix, these quick and easy grain-free granola bars are packed full of Brazil nuts, an array of seeds and chunks of dark chocolate. 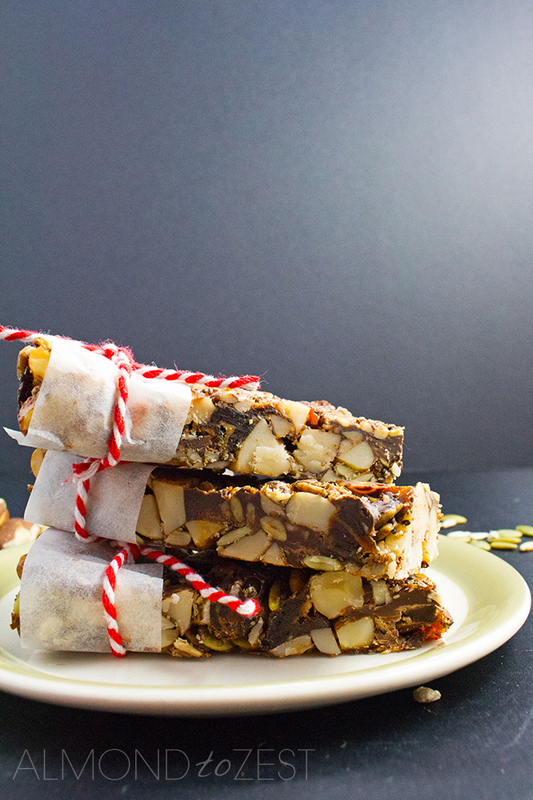 I have been so busy over the last couple of weeks making these amazing snack bars. Every time one lot disappeared, which seemed to be every couple of days, another one would have to be made at lightening speed to replace it. 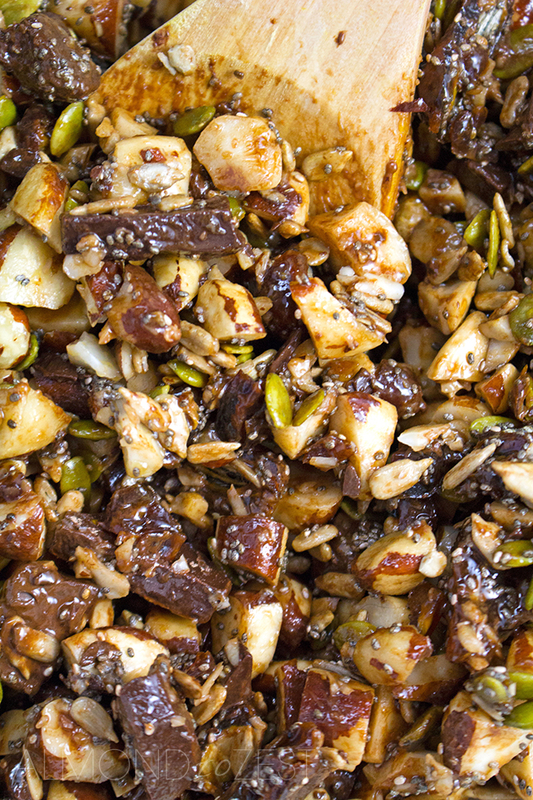 And every time I made them I would tweak them a little by either changing up the flavors by using different nuts and seeds or cooking them for different lengths of time until I got the perfect combination, which is the version I share with you today. And I can’t wait for you to try them. So the main ingredient in this slice is the roughly chopped Brazil nuts. These oversized nuts have a fabulous creamy and earthy flavor plus they are packed full of goodness. Being a complete protein means that these nuts provide the body with all nine essential amino acids, which are needed for human growth and development. They also are a good source of omega 6 fatty acids, vitamin E and B and contain high levels of important minerals like magnesium, calcium, iron, potassium and zinc. But the most impressive health benefit of the Brazil nut is its exceptional level of selenium, which helps fight free radicals in the body and boosts the immune system, one nut equals 100% RDI. 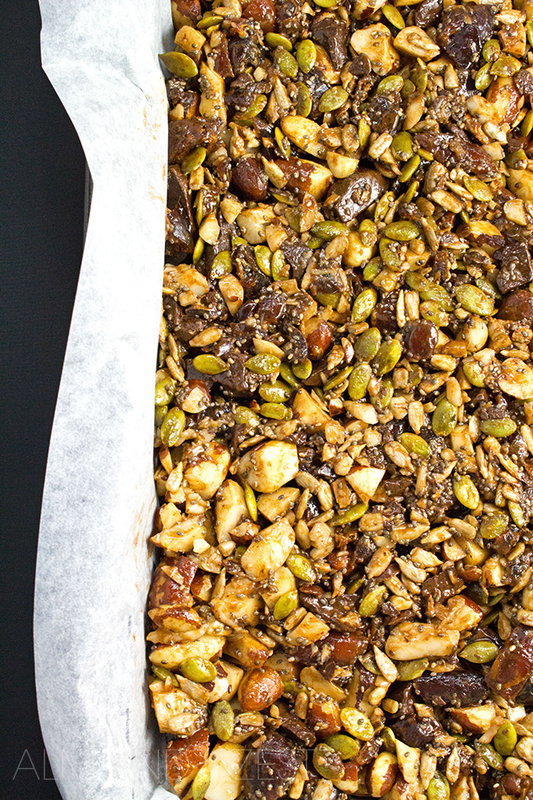 To these fabulous nuts I added a healthy mix of protein packed pepitas, magnesium enriched sunflower seeds and fiber loving black chia seeds. These guys add an array of color, texture and flavor to the slice. For sweetness I used chopped dried dates, I love the wonderful caramel like flavor they give and chunks of dark chocolate, cause who doesn’t like chocolate right? And to bind it all together I used a combo of sweet manuka honey (but any honey will do) and coconut oil. Once ready these bars will have a great crunch factor due to all the nuts and seeds. But at the same time will have a chewy stickiness from the dates and honey. If you like your bars to have a bit more crunch then I suggest cooking them for 5-10 minutes longer but just keep an eye on them as you don’t want the nuts to get over roasted as that will make the bars taste bitter and burnt. 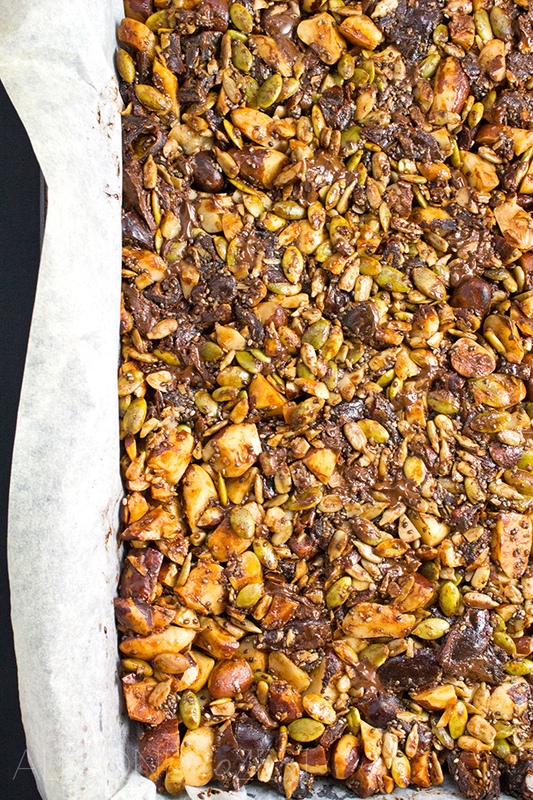 These bars will keep for up to a week when kept in an airtight container in the fridge. Preheat oven to 325F (160C). Line a 11”x7” baking pan with parchment paper. 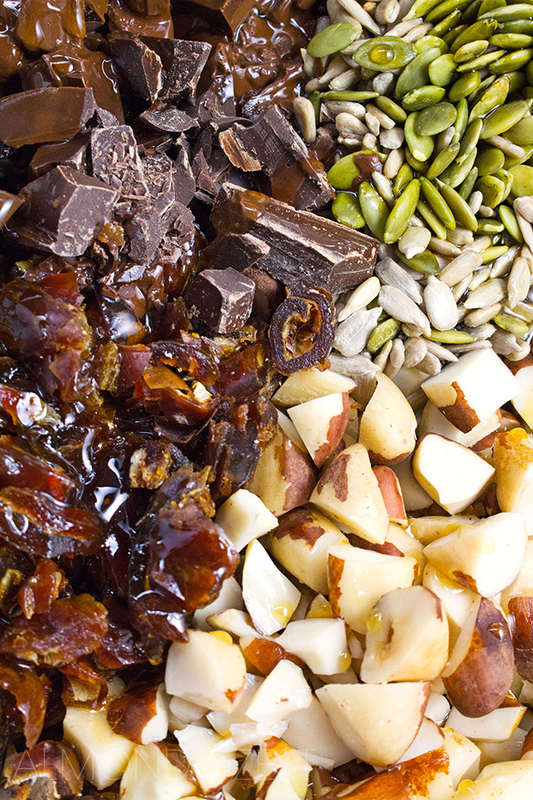 Place the nuts, dates, seeds and chocolate into medium sized bowl. Mix well. Place honey and coconut oil into a small microwave safe bowl and place into microwave for 20-30 secs untill melted. Pour over mixture and mix well to combine. Press mixture into baking tray and spread evenly making sure you get into all the corners. Place into oven for 15- 20 minutes. Remove from oven and place onto cooling rack for at least an hour till cooled. Then place into fridge for at least two hours. Take out and slice into 12 pieces and keep in an airtight container.